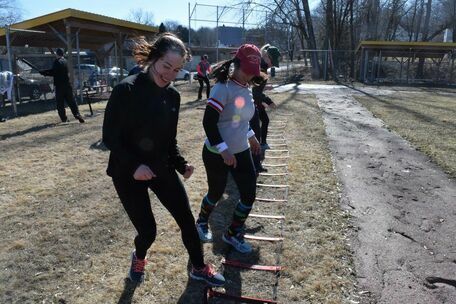 Outdoor Winter BootCamp Begins Sunday, February 24! 6 Outdoor Adventure Workouts. We meet at a designated location every Sunday. 6 Weekly At Home Workout Assignments. You'll be sent a PDF of a workout you can do at home and keep for use at anytime. There will be no make-ups for missed classes. The earlier you sign up, the more you save! The last day to register is 2/22, sessions will fill up quickly before then! Snowshoe at Kennedy Park, Lenox. 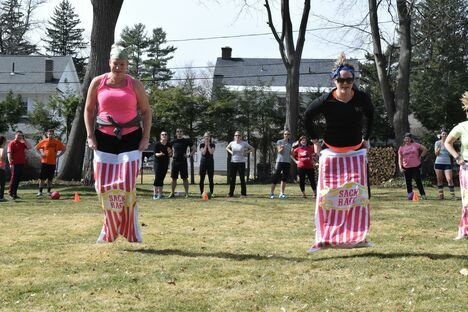 "Winter BootCamp was such a life changer for me. So motivating and fun...it got me through the cold months and jump started my entire year. I have never felt better and I am so grateful!!" "The biggest thing I loved about WBC is the support from you and all of the others in the class. Never once was I embarrassed or ashamed if I couldn't do something someone else could, instead we had teammates cheering us on to push through and continue to be strong." "Great class and great people to do it with all around!! I went into the class only knowing 1 other person and finished knowing everyone!" "The Basketball Dirty Dozen is the most hated and beloved workout I've ever done"
"Thanks to WBC I feel like I got outside this winter, normally I feel like I'm just waiting for spring"
"I completed the 5k at winter bootcamp a couple of years ago which was a huge accomplishment for me. I would have never attempted it with your caring encouragement.You have a way of making us more than we believe we can be. Thank you for giving me the strength to be a better me!" "When it was time to say goodbye to bootcamp yesterday, I just can't help but think how far I've come in the last six weeks." "I've accomplished more physically since the first Outdoor BootCamp I attended in 2013 than I ever thought I would and have learned so much about what I'm capable of."